Wine is a catalyst for commerce, driving new business development, creating jobs, and opening export opportunities. Nationally, the economic impact of Washington state’s wine and grape industry is estimated at $14.9 billion per year. That impact could double or even triple by 2020—a prospect as mouthwatering as the wines that drive this engine of economic growth. To keep the engine running smoothly—ensuring Washington’s continued production of premium wine grapes and award-winning wines with distinctive flavors—research and education in viticulture and enology are essential. The unique characteristics of this region’s climate and soil contribute to the distinctive sensory qualities—taste, aroma, mouthfeel—of Washington’s premium wines. These same regional characteristics present Pacific Northwest growers and winemakers with specific challenges and opportunities. WSU has partnered with Washington winemakers and growers since the 1960s to engage in cutting-edge research and to provide hands-on education for a highly trained and discerning workforce. WSU researchers continue to help growers site their vineyards and manage their irrigation regimes for optimum fruit quality, develop environmentally sound pest and disease management techniques, and unlock the chemical mysteries of wine flavor profiles. Much remains to be learned, and the opportunities for exploration—amid rolling vineyards and burgeoning winemaking facilities—are boundless. What secrets of regional terroir can be unlocked in the climates and soils of the Columbia River Valley? What role does science play in nuances of taste? How will scientists work with consumer researchers to unveil the future flavors hidden in Washington’s finest fruit? 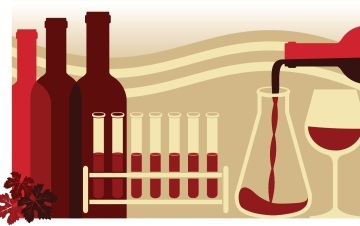 What role does science play in the quality of your wine? What are the major issues faced in growing the industry? What is WSU’s vision for the Wine Science Center? The Office of Research and the Graduate School, along with the College of Agricultural, Human, and Natural Resource Sciences, invite you to learn more about this important innovative research and the big ideas at work at WSU. Thomas Henick-Kling has directed the WSU Viticulture and Enology Program since February 2009. Before joining the faculty at WSU, he worked for 20 years as a wine researcher and educator at Cornell University, where he was instrumental in establishing the undergraduate program in enology and viticulture. He has also served as director of the National Wine Industry Centre in Australia. Dr. Henick-Kling’s research has long focused on the very basics of fermentation science: the yeast that converts sugar into alcohol and flavor components and the malolactic bacteria that converts malic acid into lactic acid, thereby lowering the acidity of a wine and improving the texture and aroma. He has helped winemakers understand the science of sugars and nutrients and their roles in the fermentation process. His research has greatly contributed to our fundamental understanding of the living processes that enable winemakers to turn good grapes into great wine. Among his various national and international honors are the New York Wine and Grape Foundation’s Wine Industry Research Award and lifetime membership in the International Association of Enology, Winery Management and Wine Marketing. Dr. Henick-Kling is the first or contributing author to a number of Best Papers published in the journal of the American Society for Enology and Viticulture, which also selected him as director of its Technical Projects Committee (1999-2006). He also served as a member of the ASEV board and as a member of the Advisory Committee for the National Viticulture Consortium East.